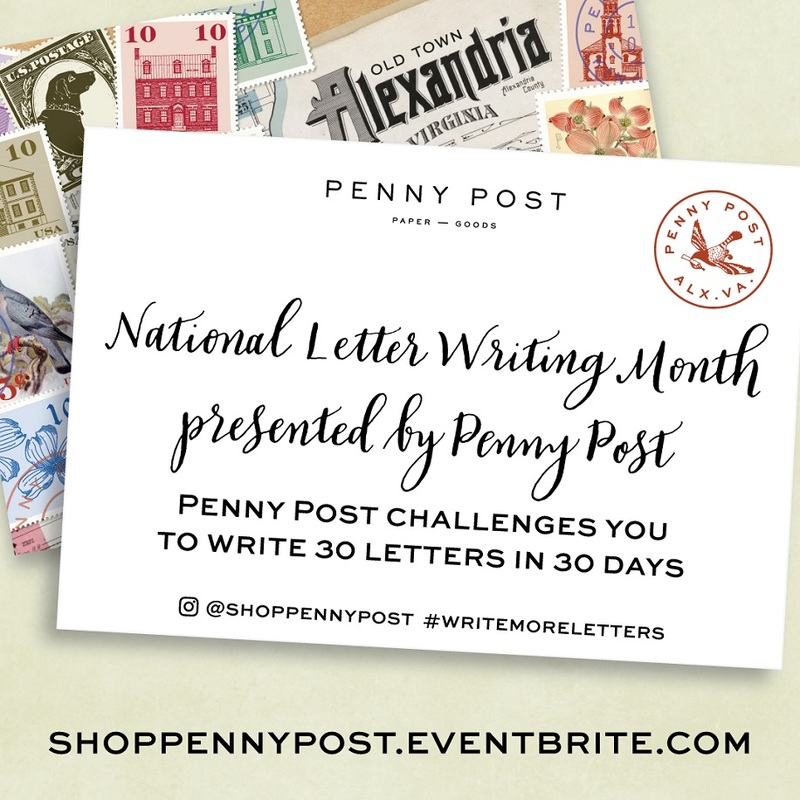 Old Town’s local paper goods store Penny Post is inviting us all to put pen to paper and write a letter to someone in April. This month is National Letter Writing Month – a national campaign that encourages connections and creativity through hand-written correspondence. And the challenge is to write 30 letters in 30 days. They are kicking off the month’s events with their monthly Correspondence Club at Penny Post, (1201 King Street). This Wednesday, April 4, they will welcome Michele Hatty Fritz of Meant To Be Calligraphy for a demo on how to create your own greeting card. And all attendants will get a kit to make five greeting cards of their own. Next up is a Saturday Morning Social with Penny Post and Nole Garey of the blog, Oh So Beautiful Paper, on April 7th from 10:00AM until noon. They will gather at Nole’s new workshop/photo studio, Common Room Studio, (428B Hume Ave., Alexandria) to write some letters, sip some coffee, grab a snack from Stomping Ground. On Wednesday, April 11th there will be a happy hour at The Hour, (1015 King St.), in their new event space, Cocktails on King. Cocktails and Correspondence will go from 6:30PM -8:00PM where you can learn how to make classic cocktails and write letters to someone in your life. There are more events later in the month. You can follow them on Facebook to learn more about those happenings. Next postAlexandria named #1 Best US Travel Destination 2018 by MONEY magazine!